There is just something about New York City. I don’t even know how to begin to describe it. Throughout my 20s, I travelled to New York City three times. I desperately wanted to show it to Poopsie, so we made it the final stop of our big trip. We left Washington D.C. at about midday. We decided to take the train so we could see some scenery along the way and enjoy a more stress free time. And we did. It was nice seeing the back parts of Philadelphia and I even had a little nap. We arrived at Penn Station and made our way to our hotel. We stayed at the Courtyard Mariott on 5th Avenue. It was expensive, but well located and in excellent condition. In hindsight, we probably would have stayed just outside of Manhattan in an AirBnB- that’s definitely what we’ll do next time we visit. I had booked us tickets to Matilda the Musical for that night. On recommendation, I used the ticket app TodayTix. I used them to book all of our show tickets in New York. The prices were competitive, it was convenient and the service was great. Back to Matilda. I had loved both the book and the movie as a child. Poopsie had a general idea of what it was about but wasn’t really interested in seeing it. We listen to an excellent Australian podcast called Chat 10 Looks 3. When the hosts of that recommended seeing Matilda, I was finally able to convince Poopsie to attend. Both of us. It was brilliant. The lyrics are all written by fellow Australian, Tim Minchin. They’re witty, heartwarming and often hilarious. 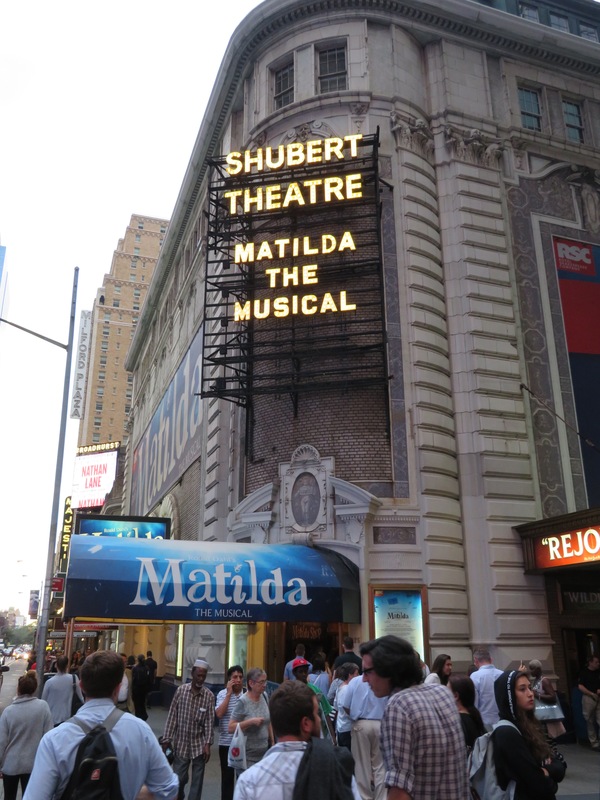 If Matilda the Musical comes to a town near you, definitely go and see it! The next day, we boarded the Staten Island Ferry. 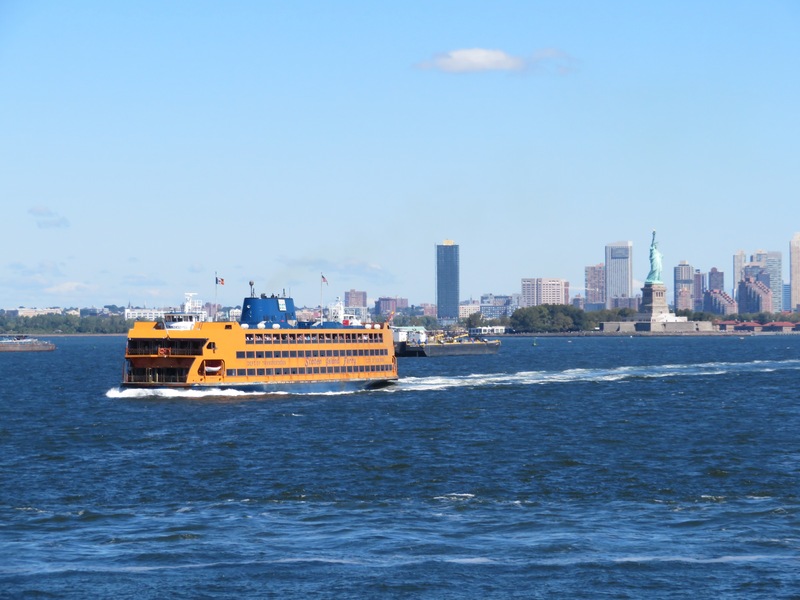 This is a free ferry that runs between Staten Island and Manhattan about every thirty minutes. The ferry goes straight past the Statue of Liberty, so this is a free way of seeing her in all her glory. 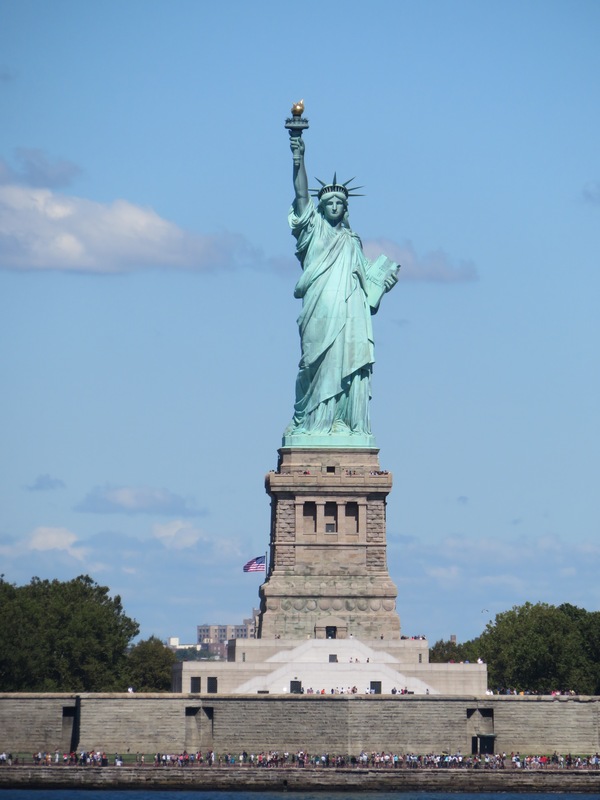 Tours to the Statue of Liberty are extremely expensive. I did one during a previous trip to New York and honestly, I think we got a much better view of her from the ocean than I did when I was standing right next to her. 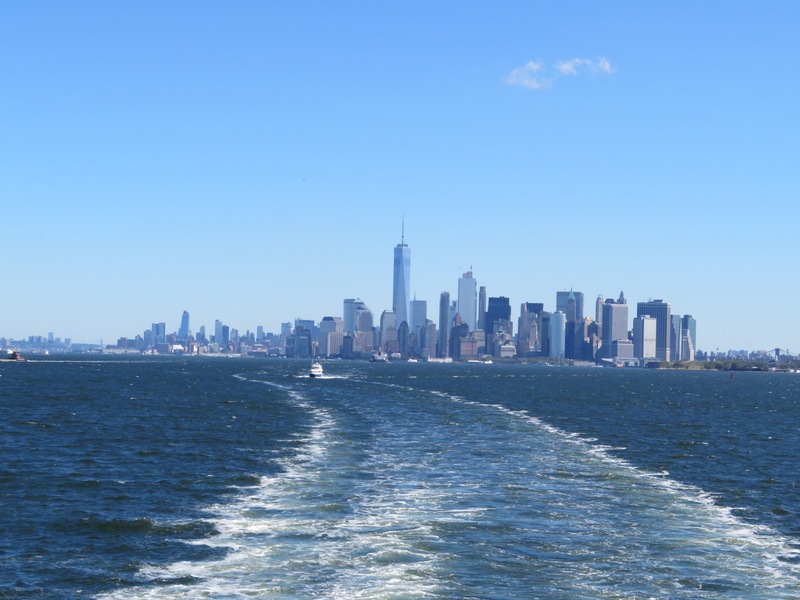 We found a small balcony at the back of the ferry that allowed us to take amazing photos of Manhattan as we sped away. 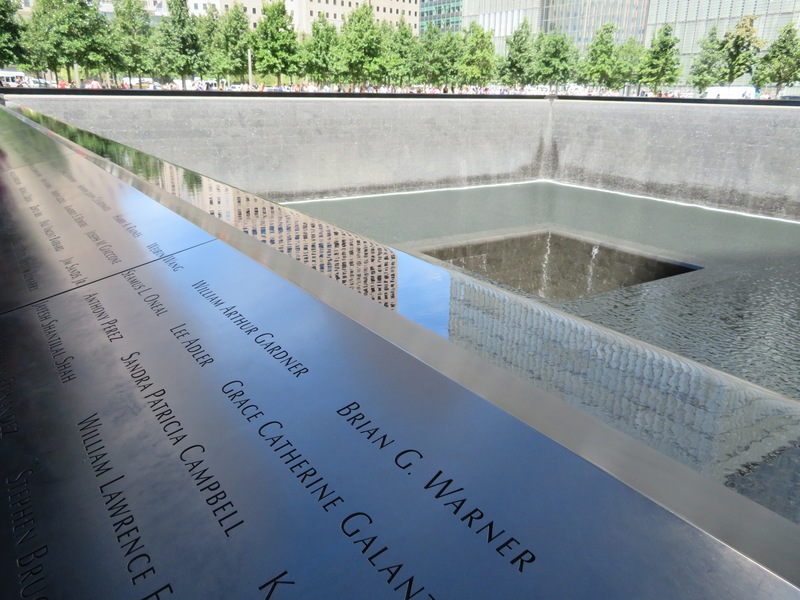 The ferry terminal is right next to the Financial District, which is where the 9/11 Memorial is located. This is an incredibly moving memorial. It was my second time here and both times, I have been moved to tears. There is a museum attached to the memorial, but we didn’t go in. I have heard it is excellent though. 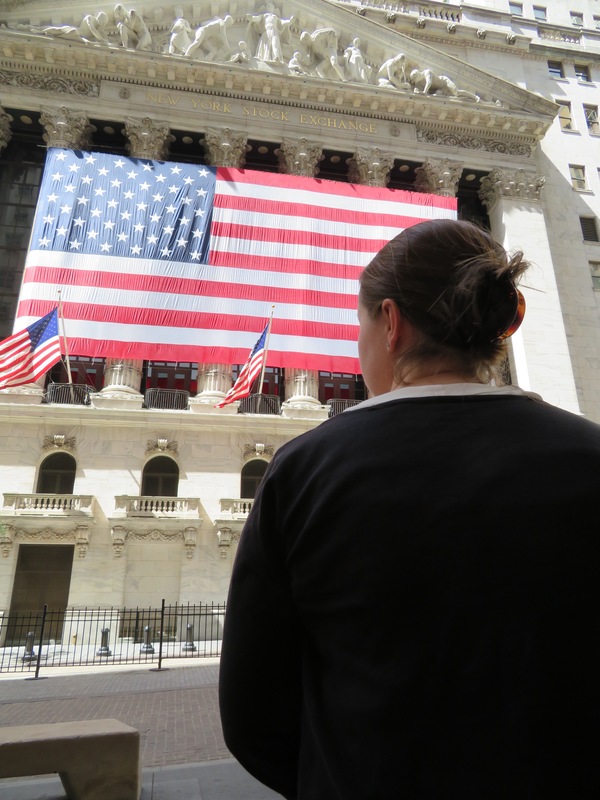 We made our way to Wall Street, home to the famous New York Stock Exchange. There were a number of nice buildings, gorgeous churches and pretty parks in the area as well. 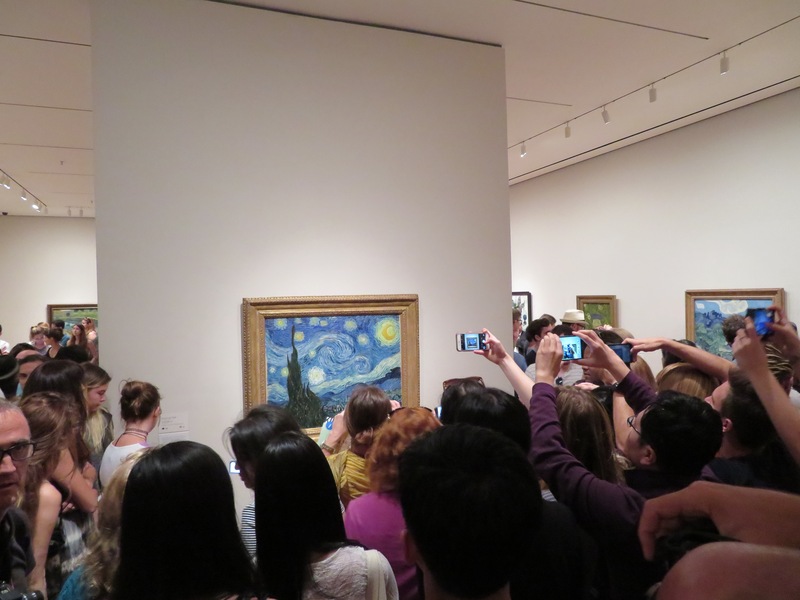 On Friday nights, there is free entry to the Museum of Modern Art (MOMA). You do still need a ticket, but they can be purchased online or at the gallery. My very favourite painting in the entire world is housed here, but it was hard to get a proper look at it. I’m not sure if it is any less busy on other days, when entry isn’t free. We would still recommend the free entry, as we still had plenty of time and room to see all of the other great pieces of art. 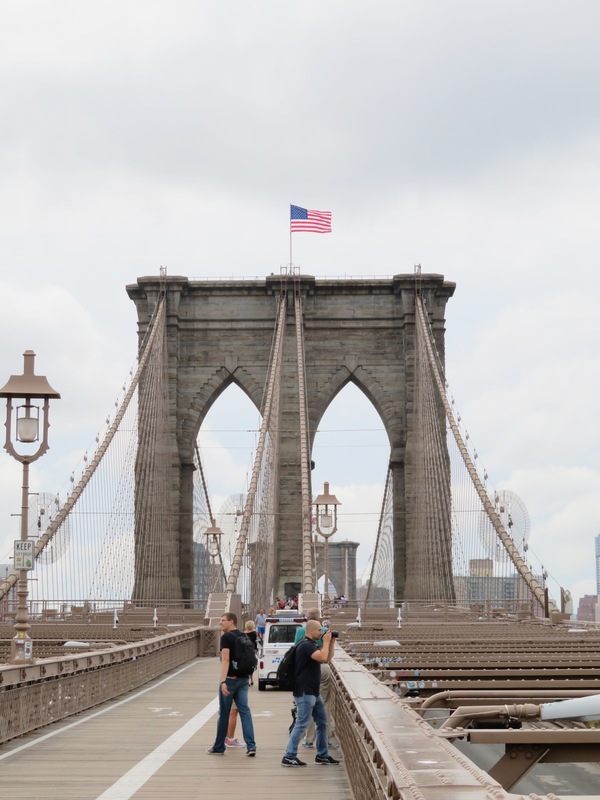 The Brooklyn Bridge is iconic, having appeared in a variety of films and television shows. 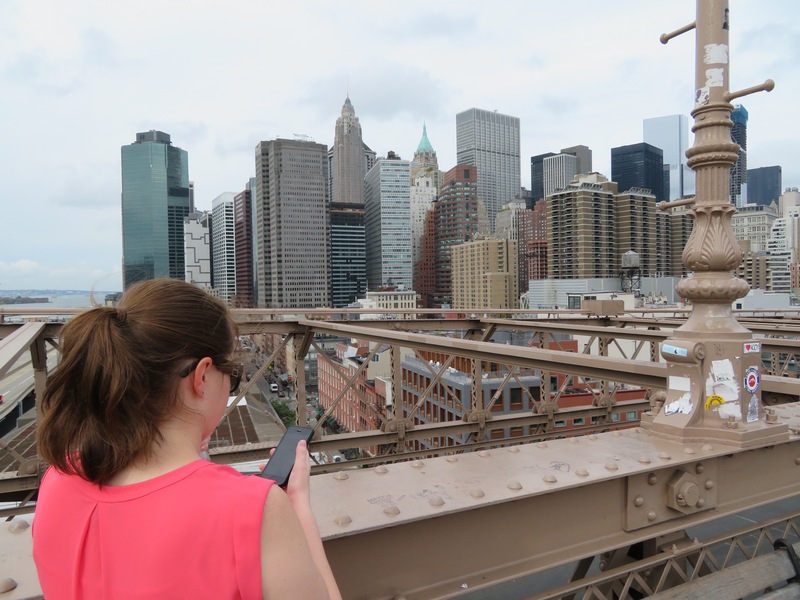 A few weeks before our trip, I found this great walking tour of the Brooklyn Bridge. I saved it to my phone and took Poopsie on a tour, reading from my phone at all the required spots. This was a great way of doing it as we could complete it in our own time, at our own pace and still get all the history of the surrounding buildings. Me reading to Poopsie on the Brooklyn Bridge. Probably even more iconic than the Brooklyn Bridge is Central Park. We decided to have a picnic in the park. Poopsie found a fantastic deli nearby called Zabars. I know it has featured in a number of movies, my favourite being You’ve Got Mail. The food selection here was amazing and we picked up an excellent feast. We picnicked under an enormous Oak tree, enjoying the shade and the people watching. After we had finished, we packed away our rubbish and were about to head off to explore the rest of the enormous park. Without warning, Poopsie dropped down to one knee and asked me to marry him. He presented me with a beautiful ring* that he’d been carrying around for our entire trip. 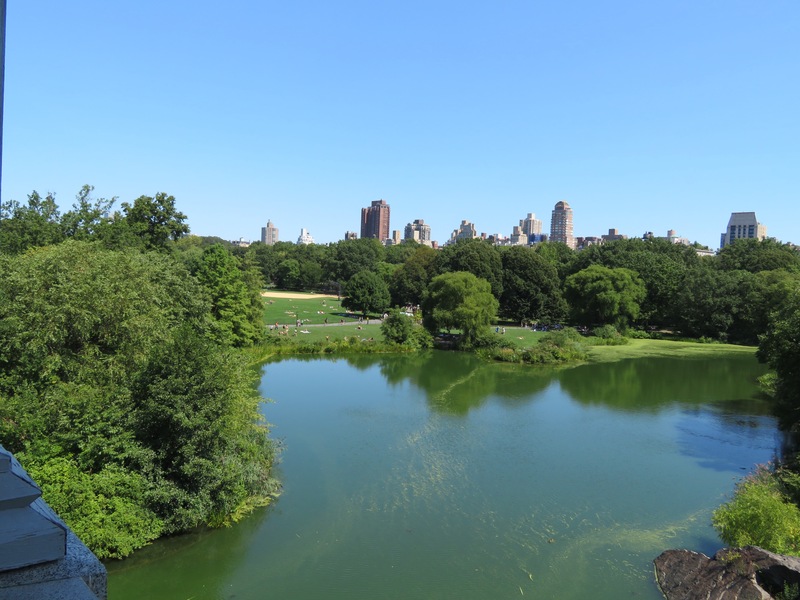 I, of course, accepted and forever, Central Park will hold a special place in our hearts as the place we got engaged. That’s part one of our New York trip! Stay tuned for part two. * You may remember in our 2016 Savings Rate post I mentioned I had not included one item purchased in our expense reports. That was the engagement ring. We prefer not to reveal the price in a public forum however, it was added in to calculate an accurate savings rate. How incredibly awesome! Congrats you guys! Congratulations! What a great way to end this post! 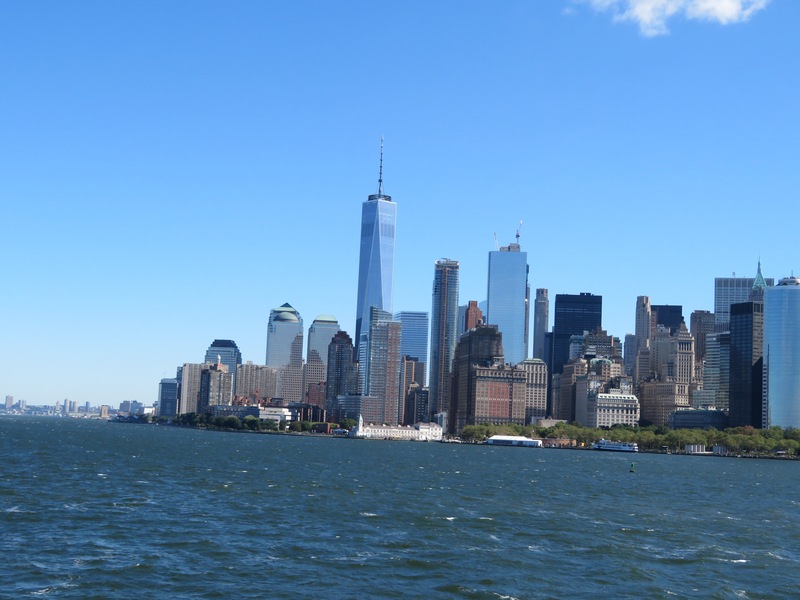 New York has always been in my bucket list and reading this post made me want to go asap Thanks for sharing! Thanks J! Look out for part two, it’ll make you want to go even more! I haven’t been to New York before, but that Zabar deli spread you had really makes me want to come. Looks like an 18 inch piece of bread. It looks like you all had a lot of fun. Thanks for dropping by MWM. 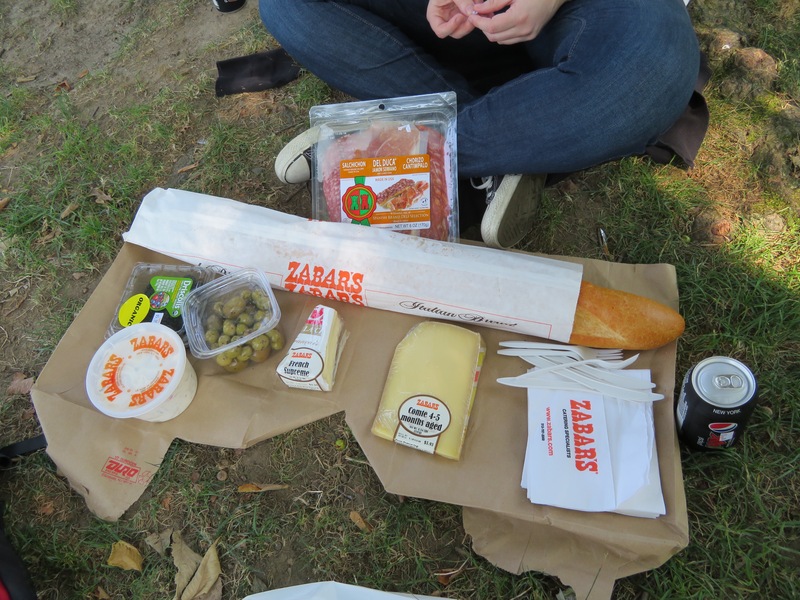 We highly recommend you get to NYC and definitely hit up Zabars while you’re there! I love the tip of catching the ferry to get a frugal view of the statue. But I have questions for Poopsie.. Did he have the ring with him the ENTIRE trip? or did he buy it somewhere in the USA? I am shocked by how well he kept calm if he had that ring with him the whole time. Yes, he did have the ring the whole time. He bought it way back when we lived in Newcastle. He carried it in his wallet during the entire trip. There were a number of times I used his wallet, getting money or cards out of it- but never found it. It was a great surprise!